of new all time highs. highs beckon with a year end rally. Many thanks, John, for your outstanding website. Best on the web! All the best to you and your family this holiday season. Much appreciated… this market may not go down without a fight… There seems to be only binary analysis of Bull or Bear out on the net and blogoshpere… what I find so difficult to reconcile in my own mind is the tension between the technical shape of the markets, demographics, solar cycle influences, and this massive transformation in the world that appears to be happening right under our noses. Not just technology per se but also the geopolitical forces gathering… which to a blind eye (Armstrong’s War Machine for example) might prove purely negative and counter productive… but “what if”. What if there is something coalescing within the fodder of the ‘fallen’ that bridges and supports us across the void? Do we NOT soar ‘and’ NOT collapse? As valid as I find the SC research, is this SC24 “different this time?” Great work John… this stuff definitely pushes the boundaries beyond the ordinary view. So it is different? Is that the first in history or just in 23 other cases? John, I always read these weekly comments with great pleasure and great respect, nonetheless I still beleive that Central Banks (Yellen, Draghi and Kuroda in particular) are in the drivers seat of the financial markets. Until confidence in them is lost by most of the market participants, the markets will grind higher. Time will tell if I’m right…. Thanks. It’s a big test of that notion yep. “The Central Banks are in the driver’s seat.” As I suggested last spring, this is the core of the “it’s different this time” argument. It doesn’t matter if you agree with what they are doing or not. We have collectively invested them with our belief in their power. Using the analogies of the emperor who wears no clothes and Dorothy pulling back the curtain in the Wizard of Oz, I tried to make the case that the next bear market would test that belief. So here we are, six months later, and although I suggested (back in May) that the test of the Fed’s invincibility would be a psychic event which may or may not align with technical and cyclical factors, I think we are in the end stages of the game. What has tripped JH up is the difference between momentum highs (which are behind us) and nominal price highs (in the Dow, at least) which are in front of us. If you were a long term investor in a mutual fund, you would have done well to have listened to JH and gotten out of the market. Short term trading (which is what most people in this forum do) is a different story. If the Dow does make new highs soon, it will be treacherous for both bears and bulls in the short run. The Dow could make a real run for it, badly hurting the shorts, or it could be a Wily Coyote moment – when Wily runs off the edge of the cliff, stops, looks down and realizes there is nothing supporting him. We’ll see. The Fed has painted itself into a corner – the essence of which is that it does not matter what they do, raise rates or not, their credibility is hanging by a thread. Thanks for the update. I am eyeing puts to get the downside protection without unlimited losses. What would you do right now? I’m already partially short (just in case we are in a wave 2 “second chance” rally about to roll over). If the Dow does make new highs, I’m keeping an eye on out of the money March puts (QQQ’s and Spy’s) for maximum leverage. How exactly those might be executed will depend on how things develop – it will be a day by day analysis with a little bit of intuition thrown in. The short term gyrations are always the hardest to figure out. Most traders (including myself) will probably be caught off guard, as usual. The market may make a momentum peak in the next few weeks, but still stay elevated for a while (keeping hope alive for the perennial “Santa Claus rally”). I’ve rarely seen so much anticipation for that year end rally – makes me think it won’t happen this year. You don’t think that *risk* i.e. the RUT, copper, HYG etc are already signalling that the top is already in? I do. We will see! I think the broad equity markets have some catching down to do in a hurry, and the risk indicators I mention suggest that starts within a few days. Equities cannot sustain as internal strength has ebbed, investors are already selling. Thanks John. I was doing some detailed analysis over the past few weeks and my views on the market next year are for an explosive move – to the upside. From what im seeing there wont be many dips but anyone who does try to short would be best advised to use stops. Buckle up, this market is about to go parabolic. Duncan, would you mind sharing the reasons why you expect this to happen please? Thanks. Clearly some component of trend following is prudent here, and perhaps a much better option than taking a directional bet and risk being wrong. How do you do that in a market that has sideways for over a year? GM, you’re right, sideways for more than a year. However, the range is quite wide and within that range there have been trends, so maybe Kevin is referring to the trends within the range. Kevin, what method(s) of trend following do you use and on what time scale. Thanks in advance. John H, thanks very much. The charts do speak for themselves. So…. I have been trying to get my head around how that would fit in given that ‘my version’ of the E Wave count, that I’ve been mentioning here, which cannot accommodate a high above the early Nov high. The following is a possible scenario that can occur which would stay within the E Wave count and still have a ‘santa rally’. The Friday high was NOT all of wave 2 but just wave-a. So we now drop over the next day or so back to the mid Nov lows for wave-b just in time for the santa rally via wave-c. Simple pimples really!! Ha! Now please can someone just pass this message on to the market for me. Thanks very much. BTW, if the above has ‘read any charting text books’ then it will rally back to touch the line from underneath before dropping off. Don’t forget we are fast approaching seasonally biased months – Nov-April and especially the Bullish period between Thanksgiving and the New Year. There were comments here a few days ago. It’s worth looking back at November 2000 and 2007. The market played an entirely different tune those years. Depends upon what Tune you’re listening to as the markets performed exactly as expected in both of those years. So, seems you want it both ways. Are you currently a bull or a bear? I’m neutral at present – I prefer to let the market tell me what it’s doing rather than force an opinion on it which can be right or wrong. If pushed for a definitive answer then I’d say I’m bearish until Dec 2016, then I’m a 100% Bull. But that does not mean I’d be short, it is perfectly ok to be bearish and trade the long side swings. Bearish at the moment, no positions, fair enough, thanks for explaining. I assume though that you think the year-end seasonals will be like normal years, rather than 2000 and 2007? Or are you unsure on that at the moment too? In which case, I wonder why your original comment on that point? Bit late to decide on that point soon really, unless you’re an observer rather than a trader of course. Cheers. I commented because you cannot ignore anything – just because you want the market to fall doesn’t mean it will, so therefore it would be unwise to discount the possible effect of seasonals especially as we’re now into that part of the year. It’s not about ‘wanting’, it’s about forming a view based on all available data. Your view it seems is…no view at all. At least I know that now, so thanks. Elliott Wave formed a view in 1986 saying the top was in 29 years later their still of the same opinion/view. https://youtu.be/QPKKQnijnsM Who decides which way silver will go? Doesn’t matter if you’re long equities, commodities or bonds today so far, looks like everything is being sold. Except the mighty dollar, but where are the buyers buying? T-bills? ON RRPS? The market may explode to the upside as some postulate. However market internals are disastrous and the trannies look to running out of steam. The only reason the markets are back up is predominantly due to a handful and I mean a handful, of stocks. Take them away and this market is below August lows. And for all the Bears… I note not quite so many as before. In the 1920’s,the final parabolic move UP did not start until the Fed started raising interest rates. This not the 1920’s. Martin Armstrong reader huh? There was nowhere near, not even remotely close, the degree of debt then compared to now. Debt to GDP is beyond extreme, Corpoarte debt to cash is record levels. US multi’s are struggling with the strong USD at present. A higher dollar will see their eranings destroyed and yet MA says a stronger dollar will pull money into US equities. Really? ?…..I say a stronger dollar crashes everything and the Fed kow it! I know you yearn for the good old days, but the world was young then, and the population is aging now. There is no reason why things should ever be the same again, as bearish as I am in the medium to long term. Well, that would be interesting to see….because another way of looking at it would be that it pretty much ~already~ happened…. Put some cash back to work on an oil play. KMI has over an 8% div and I beleive it is very safe. I will buy more if it goes down more. I believe oil is nearly done dropping, we may see one more drop, but then after that I believe it will be done. Going on the being paid to wait scheme and at 8% I like the risk. RE Oil, really need to see some solid demand growth to rule out new lows imho – that doesn’t mean we won’t see some faceripping rallies in the meantime of course…..the problem is that there is such a glut and as the “cash and carry” trade is still more than viable I don’t see much to indicate a sustainable rally. Of course, as the C&C trade becomes problematic and the curve flattens (a lot of selling of the 8-12 months+) and storage gets more and more expensive a lot of barrels will be released into the market when storage contracts expire which would depress the cash price, in a kind of wash-out style event….and I won’t be going seriously long until I see this happen. This could of course take some time, whilst Cushing is getting pretty full Gulf Coast has plenty of capacity at the current time. Of course outside of the US, there are a lot of barrels competing for business – a lot more Iraqi barrels entering Europe and China has tens of millions of bbls floating offshore. Irani barrels will come into play (officially) relatively soon to add to the supply. I have taken some initial positions within pensions in terms of energy sector but will probably wait a while as I don’t see too much reason to try to jump the gun. Seems to me the Saudis have finally woken up to Yamani’s warnings from a decade ago: pump it at max now, sell for a profit, before the world moves on to something else. Not sure the market appreciates this is a permanent move (IMO), and they will settle for stable prices at $30 pb or lower. Also, my geo-political view is we’ve already seen the end of the US/Saudi alliance,the petro-dollar will transition to the petro-euro, and the big players (Russia, China et al) are all working to the same agenda. A stormy few years ahead as the first steps are worked through. Wait til the redacted pages of the 9/11 report re the Saudis are released by the White House for the final nail in the coffin re the alliance. There is only one option to replace oil…. Fusion. It’s a real possibility, but we are decades away. Oil will have to remain the main energy source for several more decades at least. If Fusion does become a reality, then the scenario of oil going cheap is almost certain. The time frame is very questionable on this transition, even if Fusion become reality. I think the reason for the output increases is more about controlling the market than selling a commodity that will lose it’s value. We are not there yet. He doesn’t appear to grasp that gold isn’t an industrial commodity, and so will rise along with a rising USd index in a deflationary collapse (imminent). First the big deflation, then the rapid inflation leading to hyperinflations. Jeez, what will the world be like. Purvez and Valley – I’m showing strength through November 30th. Hey geno, nice to know you are around. A ‘picture’ would help please. Thx. Are you suggesting no ‘santa rally’ with your comment above? Oh! As late as that? So now we could have your ‘strength’ (though not ‘VERY’) till Nov 30th AND still have my wave-b down BEFORE Santa’s Rally commences. ‘I love it when a plan comes together’!! LOL. Geno, I am s.t. bullish until Wednesday’s open. Medium term bullish also. 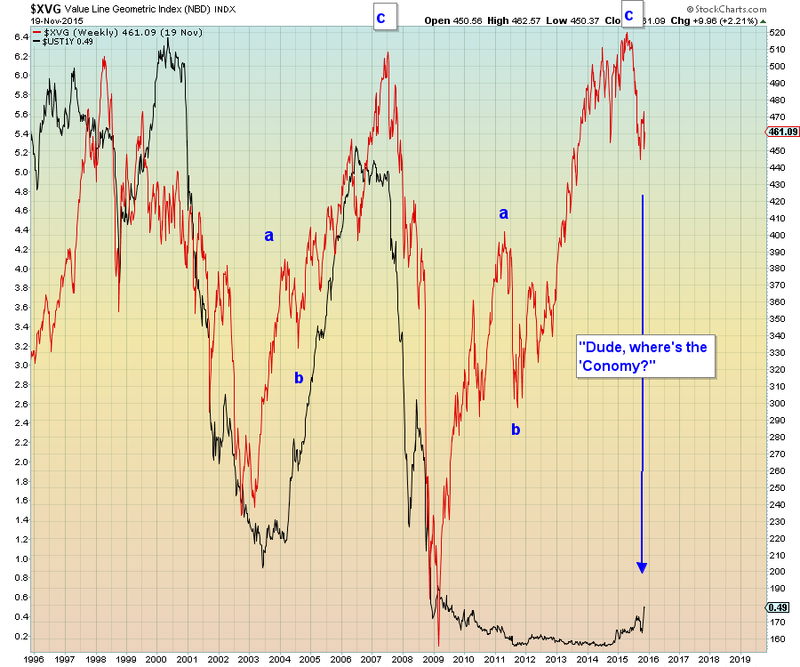 Title of piece : Macro Backdrop: High Conviction Rally Approaching? Most of the piece I vaguely understood (largely thanks to the influence of the title), but the thing that got my attention was the last chart. Although it’s marked as phase1, 2, 3, 4a, 4b it is for an EWer a classic impulse wave (irrespective of what data it is representing). The thing that the author has got wrong imo, is that the highest point in the chart is actually the top of wave-3 and not the one immediately under it. i.e. there is no phase 4a. In my opinion wave-4b should be marked as wave-a of 4 and wave-b of 4 should be coming to an end soon and wave-c of 4 should start down soon. So….why am I mentioning all this about some Stock/Bond ratio here? Well, this is the FIRST obviously BULLISH chart that I’ve seen in a loooong time and when I first saw it I stopped dead in my tracks because this looked like proper evidence that there was more bullish stock market behaviour to come. It’s only by looking at the detail of the chart do you realise that wave 3 has 5 sub waves, one of which the author has mistakenly called phase 4a. John H, before I write this post I’d like to apologise for the flagrant promotion of stuff from the AlHambra site….but right now everything I read I feel needs a wider audience: Thanks for your forbearance. OK, I promise no further posts about/from Al Hambra …..today. You’re welcome Barry. A bloke’s got to spend his time ‘some how’. Let us know what you find interesting too please. No prob. I’m a fan of their stuff too. Agreed Jeger on the oil assessment of the commodity. I still have zero interest in playing that commodity. Unless we break the August lows significantly, I am sticking to my forecast of $60-70 by end of 2016. However, Some Oil companies are looking good to me right now. Which is why I went with KMI that has an 8+% dividend on a solid company that has a great history on Divs. Just a value play. I am still bearish on the market as a whole and still have a bunch of cash. I just see some value picks in the past few weeks to take some risk on the long side. Nothing huge, just some bottom picking hopefully. I think oil will hover around 40-50 bbl for the next 2-3 years. I certianly believe that is a possibility as well, but I am sticking to my forecast for now. No way, we’re headed to low 30s, probably 20s. low 30s …20s would indicate global war w/ more than isis/isil. venezuala is already accusing the US of economic war and driving oil prices down. Nope, just the next phase of Depression 2.0. A fascinating see-saw day in so many asset classes today. For me, the huge swing in the 30 year UST yield was most remarkable. Bill Gross lost a few billion shorting this pig back in 2011 I recall (inflation, here comes inflation…yeah right Bill, off you go). Anyone care to short the pig right now? Hmmm, GM, if this is a triangle as you suggest (everyone here knows my record with calling triangles – not good is an understatement) then I would be very happy to ‘short the pig’ once the final down wave in yields occurs. I wish I understood anything else other than DJIA to be able to trade it. 2 brain cells have their limitations unfortunately. 200 sma starting to slope up. Very different from 2007/8 where it wad sloping down and stayed down. these are juat some. There are others though. Is M1 relevant these days, in eurodollar dominated world? I don’t give it any weight. 200sma, well, looks flat to me, and the index (SPX) is indecisive, above and below it. 50sma is currently upward sloping, but the crossover looks like wishful thinking rather than ‘about to’. Bollinger bands look wide to me, relative to April- August. Credit markets, have to disagree there, they are tightening, CCC and HYG going the wrong way. (Except energy is a cop out, because energy cannot be ignored). Oh well, we will see. Duncan, can’t say that I ‘fancy one’ but since I don’t have a choice I’ll take ‘whatever’ the market gives me….and hope to make lemonade out of it. I’ll be selling it cheap if you care for some. Yes, I expect pre-holidays in the US to be generally bullish and it can be backtested as such. Turnaround?, from a 0.12% drop on the SPX ! This one’s for slater. Look at the 2011 top, amazing. Tradingview offer a free basic version, very top-notch charting site. John your analysis continues to be quite telling, but tops take time and this top is finally about out of time. i’ve enjoyed the long swing trade since late September, but expect to be changing teams in early 2016 as the SPX tops in the 2150s. The time for bears is coming, it’s not quite here yet. Thanks. I respect your work. By various indicators the first peak was July 2014, then a second peak May 2015, so that’s the topping process I see. A third peak seems unlikely, but we’ll see. with the drop so far. 🙂 🙂 Phil, the ABSOLUTELY nice thing about 2 brain cells is that you can’t devote either of them to negative thoughts. So yes I’m happIER…but just so everyone understands, I’m ALWAYS happy. Any other state would just ‘confuse’ the hell out of me. Hahaha! great Attitude Purvez. I Agree whole heartedly with your philosophy. Thx, JaFree. It’s a ‘way of life’ that I’ve become used to. Would whole heatedly recommend it to others with ‘more than 2 cells too’. LOL. El Nino’s warming effects on the Northern Hemisphere Winter are over. The Trend into a Mini Ice Age is reemerging. The time has come to go long HO and NG. As the Northern Hemisphere Winter transitions from a warm winter to a winter colder than the prior two winters I am expecting HO and NG to experience Intermediate crashes “upwards” instead of “downwards”. Richard I, please see my comments below. I thought they would appear here but through the wonders of modern software they….didn’t. Ha. Volume remains high, even during this US Holiday week, which is usually low volume. Yesterday was pretty high volume. even for a regular day. I believe this is not a good sign for the bullish as I have indicated before. It seems to me that the big money managers that need to sell large amounts are sticking around even during this Holiday as the prices remain elevated. Now I wonder what will happen if the FED DOES NOT raise interest rates in Dec? Bob C, if the last time is anything to go by….the Fed said they would DEFINITELY raise rates in December and the market rallied hard. So… if they DON’T then by inference it should FALL HARD. No? The market rallied hard because it got another 2 months reprieve. By inference , no increase will be another reprieve, etc. That’s ok Bob C. Most discussions lead to a clarity of one’s own mind. I’ve experienced that many times…with gratitude. Sorry Gold bugs, I probably just ruined your chance for a rally as I just purchased some paper gold long. I have never had much luck in gold, so you are probably doomed. Of course the other mistake is I went paper, because the retirement account options for physical gold are a real pain. I still may get some physical from taxed money. Nothing wrong with paper, until the end game when Comex and GLD and IAU and CEF all default. We’re not there yet. site yesterday and they had a summary of the up coming Mini Ice Age. They mentioned the Maunder period a lot and also showed some photos of famine across the globe. That’s what they reckon is coming our way between now and 2030 something. So your research/analysis fits in with that. Ugh. I wonder if travel to mars will be available by then. The Maunder Minimum was an extreme period that was exacerbated by some nasty volcanos. There are scenarios that claim that volcanoes are common in these low solar spot periods, but the truth is we have no idea what so ever how deep the cooling will be. We have very little data to actually determine any reliable forecast. We certianly do have enough data to determine a high probability of cooling over the next 30 years, but exactly how much is quite murky and dependant on factors like volcanoes that we cannot predict reliably. One thing that we will gain from this period, is it will be the first time that we are able to measure the Sun with Satellites during a Solar Minimum. Of particular interest to Habibullo Abdussamatov, a Russion Solar Expert, is the diameter of the sun as a predictor to the Sun’s activity. This is the guy that made it clear that the Sun is the driver of heating an cooling by pointing out among other things that other planets warm and cool in similar cycles as earth. He seriously wiped the floor with the rest of the world’s Solar Spot predictors who had this last cycle going much higher than it did. Even worse, if you read all the NASA web pages, there is no mention of him at all. But if you look at the dates of his predictions, he predicted earlier and better than the so called experts. Ok getting winded here. In short scientists are clueless about how the Earth and Sun work. We just do not have enough data or basic understanding to make reliable predicitons. Failures are HUGE. Too many people in this world think scientists know more than they do. JaFree, the reason I read the ‘suspicious observers’ site is because they are NOT ‘Gov’t scientists’. These, as far as I can tell, are just people who are amateur enthusiasts…..imo the BEST kind of researchers around. I have since around my teens realised that dedicated amateurs are MILES ahead of ‘Professionals’ in ALL fields of …. well ANY ENDEAVOUR. You clearly have a much more detailed understanding and knowledge of the subject than I do so I’d be very happy to hear more from you on the subject. All I was trying to do was tie up Richard I’s comments on a cold winter with what I had read the day before. I am not bashing Scientists either, there are plenty of humble scientitsts in this world that understand our limitations, but rarely will you here about them in the news. Stating facts and realities is rather boring to most. We need to glaciated cities and fire ravaged agricultural areas or anything else that will make the public read a story. AKA the fringe that sells newspapers. The NY Times, a VERY reputable news paper right??? What a joke. Their stories over time blame the same catastrophe’s on different events. No joke if you look you will find that all the EXACT problems being blamed on Global Warming were blamed on Global Cooling. I agree with you that many amatuers can see obvious truths that are hidden by the EXTREME propoganda happening today, but if you ever desire to research, you will find plenty of good scientists, not playing the political game. Infact NOAA is being investigated right now by some whistle blowers within NOAA concenring a corrupt paper from Dr. Tom Karl. He uses Surface Temperature data that is well known to those that follow this topic to be highly modified to cool the past and warm the future to show a false warming of the planet. The evidence is all around the world of tampering of data. Another German Scientists recently confirmed the corruption, although he is just verifying what is already known. the bottom line is surface data is garbage. Only Satellites can properly judge the Earth’s temperature. And that record is very short. Surface reconstructions and Proxies are extremely corruptable. Not to say that we cannot use them, but just understand the limitations of the information. Some do understand and others have a political agenda. Sorry for the diatribe, just a pet peeve of mine. I try to do my part by pointing out our limitations in scientific knowledge and how it is applied. It really bothers me to see how people will twist what we truly know for an agenda. If the data continues to show that global temps are rising, how can some climatologists still be forecasting a multi-decade cold spell ahead? We can argue about forecasting methods, and it’s true that long term climate forecasts are extremely difficult due to all the variables that are involved. But how can you argue with data? I don’t think we get to have opinions about data or facts. Something is true or it’s not. Something happened or it didn’t. Temperature readings are what they are. If the average annual temp for where I live is 70 degrees, I don’t get to say, no my OPINION is that it’s 65 degrees, all the temperature readings that were recorded over the last 100 years are wrong. pimaC, part of the problem is that there are doubts about the temperature readings themselves. Difficult to know who to believe hence I gravitate towards amateur enthusiasts rather than ‘official’ observers as my faith in the latter has been…shaken, stirred and then sloshed out the window. Pima, Ask the folks at NOAA that quite literally adjust the temperatures from the past. Ask them why they do that? Ask them how they create temperatures out of thin air in areas for where there are no thermometers within 100’s of square miles? Ask them why they have allowed the rural stations to die and keep the stations surrounded by 15 lanes of traffic and do not adjust them for Urban Heat? You ask really good questions, but you are wrong that something is or isn’t when it comes to temperatures. There is manipulation galore in this area. It really boils down to instrumentation accuracy and that is not so easily defined and allows for manipulation. Ask why do we have reports from the past that do not match reports from now during the same time frame? Did we not know how to measure temperatures back then? The most important thing you need to ask is why do the land surface temperatures not follow the more accurate Satellite temperatures? The information is out there if you want to find reliable accurate reporting. So what you’re saying is that you don’t believe the data? The data itself is subject to revision by you? Where does it stop? The sky is red, the ocean black. I can make up anything and have it be true. I can come up with any conspiracy theory I want and if the facts don’t support the theory, then I’ll just change the facts! Where is the evidence that NOAA is “adjusting” temps from the past? You’re saying they are DELIBERATELY changing data from the past? How do you know this, or why do you think they’ve done this? We have temperature records from some places going back more than 100 years. And you’re saying that NOAA is CHANGING those records? How can they change data that was recorded 100 years ago? What’s your source for this? Seems like fraud on a very large scale, or maybe someone is wanting you to THINK it’s fraud on a large scale? Pima, in case you are tracking this thread, I responded far below. I do not mean this as an insult, but you have much to learn on this topic. You should be careful about making comments before you investigate. purvez, Oh and great site. Any site that shows realities in contrast to what is being pushed by Gov. Scientist is great in my book. Freedom of the internet and information dissemination is how we keep these jokers (ie scientists with agendas) honest. Clean snow is 80% reflective of solar energy. Currently, Siberia has greater than average snow cover and the USA has average not less than average as is implied by an El Nino. The El Nino is powering up a Pineapple Express that is providing moisture for greater than average snow cover. That is because the Trend is towards another Mini Ice Age. From now to January USA snow cover will become greater than average and temperatures will plummet as the El Nino keeps pumping up more moisture that becomes snow instead of rain. Also, currently, the Siberian snow coverage is expanding west to Eastern Europe as the Northern Hemisphere keeps cooling and cools ever more with ever greater snow coverage. I expect this Northern Hemisphere Winter (more than just the USA) to be colder then the prior two Winters. By the way; anyone recall what the prior two USA Winters did to the USA economy? Yesterday, on 15 min bar charts (I went long), NG rallied up in an Elliot Impulse Wave. Last night and this morning it “corrected”. Now it looks like that it is rallying, again, in another Elliot Impulse Wave which looks like the much coveted “third wave” (of minor degree) (for day and three or four day swing/pivot traders). For all the short term Traders (which seems to be most on this blog) note that today’s correction lower of January, 2016, Natural Gas futures was a perfect 76.4% Fibo. This strongly implies that the correction lower was an Elliot Second Wave and that an Elliot Third Wave higher is underway. The Rutgers Snow Lab is probably the world leader in tracking snow on this earth. World Wide Fall Snow has increased, but Spring snow is tending to melt faster. The next 3 years will probably bring the strong La Nina as you predicted and now the data supports. Cold and Drought coming for the US. Look out South West US. Beleive it or not, Snow becomes less likely in the Cold Ocean cycles, because there is no pumping of the moisture in the atmosphere. The Weather for this winter is very predictable. Not all El Ninos are the same. This particular El Nino as I have stated in the past is a Central Pacific El Nino. This leads to cold and Snowy South and Eastern United States. NOAA CPC long term predictions are horrendous and they are consistently poor. I definitely agree that the coming unexpected Winter will provide NG opportunity, BUT, Falling Oil could spoil the punch Bowl. I am definitely waiting out this winter for my currently poor NG investments to see if we get the expected spikes. Heres to hoping your right Richard. Because last week’s storage numbers hit a new ATH the NG market was slammed lower. The truth is that storage is not keeping up with demand; statistically speaking. Every electric company is switching from coal to NG and demand is soaring. A cold winter will show that storage has not keep up with demand for a very cold winter. Rig counts have collapsed. Last week’s storage numbers were less than expected but at new ATH. This time of year storage numbers usually decline. The AO and NAO are “positive” (hot) but trending towards “negative” (cold northern hemisphere). The ENSO is the only one of the three that is trending towards warmth. I think that current weather all over the northern hemisphere is showing what would be expected from both the AO and NAO trending towards being negative –together: very cold northern hemisphere. If that trend continues then the truth of ENSO will be to add to that cold by providing the moisture for both large areas and deep amounts of snow cover. I expect this winter to end up colder than the prior two winters and for NG to rally most strongly. Note that either the AO or the NAO being “negative” means a cold northern hemisphere but BOTH being negative makes the odds very high for cold to very cold. I mean this sincerely Richard, welcome back, interesting info today. Life is for optimists, as long as it’s not the blind type. Phil, can’t say that I haven’t had my FULL SHARE of disappointments or that I’m done having them either but given the scarcity of my thinking apparatus I just felt it would be better used looking for the positive in life. Funnily it’s like a habit. Practice helps I find. When’s the last time NATO shot down a Russian plane? Indeed. I don’t agree with everything Ron Paul says, but he makes a good point in this article. Wars are for bankers, for weapons manufacturers, for generals. All that human suffering makes a few rich people even richer. Purvez & Valley – I sold those Dec SPY 210 puts today and rolled back into Dec SPY 208 calls. I told you I wasn’t messing around with these puts much. Closed them out for over 20% gain. Strength in the markets should last through next week imo. I’ll consider getting short again then. Very nice call indeed geno. Congrats on the trade and hope the calls make you even more. Bulls might feel they’ve won a battle today, but they did the same back on 6th and 7th of November, fat lot of good it did them. I feel the longer they are trapped below this descending resistance, the more it runs out of steam, every rally sapping energy as declines follow. Oops GM sorry hadn’t refreshed and so had not seen your post before my comment lower down about similarities with the early Nov action. Good call. Looking at the DJIA’s pattern on the 5 minute chart from the Friday highs and comparing that to the pattern from the early Nov highs looks eerily similar so far. Now as they say, markets seldom repeat but often rhyme. Hmmm I wonder when this ‘rhythm’ breaks it’s pattern. Fed gonna raise rates?…..I hereby put both my you know what on the line that they don’t because they CAN’T. They painted themsleves into a corner and apart from that a rate rise halfway through the holiday season?!!……..puleez. Does anyone REALLY think they would even consider raining on Santa’s parade even if they could raise rates? Allan we all agree…no need to put your gonads on the line to prove the point…LOL. Far better to enjoy the Festive Season in ‘one piece’. 9 fed governors not only wanted to raise the fed funds rate, but they want to raise the discount rate too. war, terrorism, 5 % year over year drop in sp ebitda, insider selling ramping up, musical game of chairs shrinking the number of stocks to buy and zuckerberg going on 2 month parental leave. time to get the popcorn as the algos convince everyone to buy the dip for the final draft up to termination. There is some reverse symmetry fractal action occurring and from what I can see it is currently retracing the action based on the last week of June 2015. If indeed this is the case then today should hit a higher high than yesterday and tomorrow should have further upside with potential even for a huge gap up. This shortened week should close rather bullish but implications then favour some sideways weakness for first week of December. Mid-Dec to early Jan should favour an extremely powerful surge and I would anticipate an incrementally new ATH by that time. I suppose this assumption would be for a Fed rate increase of 0.25% and markets rally hard after an initial temporary dip on such news. 5 % year over year drop in sp ebitda, insider selling ramping up, musical game of chairs shrinking the number of stocks to buy and zuckerberg going on 2 month parental leave. From your mouth to ‘god’s’ ears!! Please may I ask if anyone here knows what caused the pre-open fall? I’ve heard about some Russian jet being shot down. Would that be the ‘reason’? I’m trying to ‘count waves’ and at the same time try to work out what caused the ‘outsized’ down wave. I’m sorry to ask this but I’m trying not to listen to every tiny bit of news and hence the question. Turkish jets make target of allied Russian jet with NATO oversight. NATO is not autonomous and nor is a Turkish attack on allied military. This action has been attempted previously and now repeated successfully. It is an act of war by the US against Russia and part of the ongoing aggressive campaign by the US military against Russia using surrogate NATO and a proxy terrorist supporting aggressor. The US manufactured the terrorist problem same as it manufactured the forgotten Ukrainian problem for the purpose of manufacturing war and benefiting from the proceeds of ongoing sales of arms and armaments. Anyway, Russia was interrupting the oil sales that finance its surrogate terrorism. Now get back back to where you belong. Wow Peter_ you CAN talk sensible English!! I sadly agree with your conclusion. We are heading (if not already in one) to a state of War amongst the Super Powers. Basically, the DAX had a down day, so the DJIA had a gap down open. Selling pressure may come form such events or may not, nobody knows who exactly was selling and why. It wasn’t just a Russian jet shot down, but something that may sparkle WWIII ( although some say that WWIII had already begun). I believe the current Pope is on record to say that the WWIII has begun ‘but in parts around the world’. I’m paraphrasing here. It sadly does feel like that. Hope all our ‘gods’ can unite to save us ALL. 6 times since Friday close the Dow was repelled at 17860. Good level for good scalps. Very good observation despe, thanks. I hope we don’t have any more tries though because the longer it goes on (the tries) the more chances of breaking through. STOCK TRADERS BEWARE: Tomorrow’s EIA report could send the S+P 500 and DOW unexpectedly higher should the energies rally from the report. Usually, last week is the first week of the seasonal drawdown in NG but last week saw a slight build. Due to the collapse in rig counts, the recent cold weather, and the historical trend being against any more seasonal build in NG storage; tomorrow’s NG report will likely show a drawdown greater than expected resulting in a strong upward reaction in the energy futures AND ENERGY STOCKS. Thus, the “broad” stock indexes being pressured higher, possibly, to new ATHs. (I am still expecting a new ATH for the DOW and S+P 500 stock indexes before I get aggressive about shorting them). But what if *SHOCKER* we go down now for the next year, and for the sake of 1% in returns, you miss out on the biggest crash in a decade? it amuses me how the perma bulls are certain we go straight up through thanksgiving and on to the santa claus rally. the same arguments were made last year on dec 4th….. we had just recovered from the october swoon, thanksgiving week prior to turkey day was up 20 points. take your pepto bismall, or eat a chipotle burritto to give yourself a good cleansing. volatility lies straight ahead. we are experiencing lower highs during your wonderful turkey week vs last years higher highs with way more geopolitical risk and potential for black swans everywhere. If you are correct, the market should help with bullish intestinal fortitude. I also see that the Volume for this Turkey Week is nearly double last year. I see this as Big Money running for the doors. Basically the Volume has been high since the Aug. drop. This is a Beasrish signal for me. Hooray!!!!!! Money for everyone (except the little people) and an endless supply. What could possibly go wrong??? 7. also today, IMF gives Turkey $3billion euros to “help” with its migrant problem. i think it was a bounty for the russian jet. Obama backs Turkey and tells russian it was their own fault. 8. same day this occurs, Chicago releases a video of a 17 year old black male on PCP holding a knife getting shot 16 times by a cop now charges with murder….by the way the incident occurred 13 months ago. This time however, the US won’t be able to join the global conflict at the end to clean up the mess. Europe’s divided, some still believe in the US, for some the American government is their worst enemy. Sadly, the Americans don’t even know who set fire to Ukraine. Scott, there is another way of looking at the geo political outlook. US/Russian relations were on the floor. there are also some positives in my view. That’s a very ‘glass half full’ view Phil. GM, Phil’s just practising to be a ‘glass half full’ guy. We need to give him all the encouragement we can, please. Ta. All going well so far. Markets poised for more bull. Latest dip was a great buying opportunity although I didn’t as was waiting for a bit more of a drop. I guess we find out over the next few weeks. I was referring to my trades. There is still room for a 2-3% drop before we power higher in the Santa rally. Shorting is very unlikely to bear much fruit this year. 2016 provides much better bearish opportunities. In my humble opinion the best potential trade for the next six months is long Natural Gas. El Nino only has a slight factor for warm winters otherwise what El Nino primarily does is it –magnifies– the winter trends of other factors. Those “other factors” are pointing towards another very cold second half of winter. Add El Nino to those “other factors” and the second half of winter could be colder than the prior two winters. Time and Place: the primary factor for a very cold second half of winter is a larger than usual snow cover in Siberia in October. This is what happened in the prior two winters and has happened again for the third Siberia/October connection in a row. Given that potential winter “demand” for NG could exceed “supply” and NG could go stellar as “rationing” sets in. US of A Natural Gas production can not keep up with winter time demand which is why there has been developed underground storage to meet that very high winter time demand. Problem is that “demand” has grown greatly but supply via underground storage has not. Demand for NG keeps growing due to coal fired electric generating plants converting over to NG. If this winter is unusually cold then this “imbalance” may be brought forward as market place price rationing takes hold and NG prices go stellar. The initial weeks of rising energy prices could help to pressure some stock averages up to new ATHs. This El Nino is much like the 1957-58 El Nino and I have been saying expect a cold East coast, including Washington DC. This has lead me to beleive the Highest population areas of the South and East Coast will be cold and this will hopefully cause the Nat Gas spike I am waiting for. The entire US will be cold until about Christmas and then it will warm in late Dec to early Jan. Then the next wave of cold will come for the South and East Coast while the North and West are mild. Snow is difficult to predict, but higher amounts are expected for the Southern Appalachians and Texas area. This could easily shift around and areas of the East Coast could get hammered, like DC in ’57-58. When all is said and down, it will be a slightly colder than normal Winter for entire US, but the cold will be concentrating on the high population areas. The risk is that the mild temperatures in the North Mid Section could allow for Rigs to produce more than normal. I am sticking to the belief that we will have solid demand and that will outstrip production. Todays NG report forecasts are all over the place. From about a draw of 5-100. It will be interesting, but next week will be the big draw as these reports are delayed by a week. Utilites are burning Gas like crazy right now. We should see NG out strip Coal again in total production as it did last Winter as well. I do not see that we will have a shortage of storage this year, as we have higher than average stored right now. And, I have to say I was impressed with the production this Fall, it was more than I expected. Overall we agree, now let’s see if we can turn it into money. Yup, Richard, right on Target. NC Mountians are tagged as 200% normal snow by Joe Bastardi. Also, for anyone involved in yesterday’s question on how Climatoligists can predict 30 years of cooling. The PDO and AMO both going into the cold phase is how you get there. I did not answer that question yesterday. This is a 30 year hot/cold cycle based on the Ocean cycles. The Sun Spot minimum is the wild card. This could send us into the deep cold, but how cold? That is the hard question. In the past several years some scientist have made the discovery that greater than average snow coverage in October in Siberia “causes” extreme cold January thru April. I have found no evidence that those particular scientists have made the connection to the trend into a Mini Ice Age that I hold to be the “cause” for that above average snow coverage in Siberia during October. Given that this has now happened for three years in a row raises the odds that it is Mini Ice Age or Solar caused (and will keep on happening for years into the future). Different scientists are making different discoveries and it is up to us to pull it all together to make money off the markets. Yes Richard, Our Satellite era is finally getting mature enough to see some cycles. Ther are much longer cycles that will take a while to sort out. We have a long way to go to sort out all these factors and how they affect the planet. usually, if it works for you then it’s a simple way to make money. This year’s crash in stocks was a combined Delta six point rotation Long Term Inversion/Crash Window with the Intermediate Inversion/Crash Window. Last year’s crash was the eighteen point Long Term Inversion/Crash Window. The Energies have just entered into their Intermediate Inversion/Crash Window and I am of the opinion that there will be a “crash” and that it will up instead of down. Because I hold Delta to be a double stripped down version of a greater and unknown Celestial Body theory of market behavior I keep my eye out for other factors that would better explain what will happen Delta-wise. There were 2 things in the article that caught my attention. One was a scenario he described about a Civil Service Jobs announcement from 1930’s but the second was the one and only chart in the piece. It’s a relentlessly rising chart apart from the tiniest of kinks. What the author had to say about that kink was ‘sobering’. Hope some of you read it. I am definitely in that camp of thought. Foundations crumble while the leaders press on and the public as a whole is unaware of the serious issues. We definitely seem to fall in that category right now. Over leverage being the issue to cascade the banking system. We saw the danger in 2008 and we didn’t solve it. We transferred it to the Gov. via the FED. Somehow people think this is fine, but I do not. We have serious structural issues to work through and whether we pull out of it cleanly is unknown in my eyes. Yes, JaFree, the world is crumbling around our (mine at least) ears and it’s almost like it’s a silent movie…as we don’t appear to hear the sound. The populace has been ‘conditioned’ for too long on ‘bread and circuses’ to realise what is happening. I have discussions like this in my household and find myself pitted against all of them including my better half. It’s a good thing we’ve been married for over 36+ years to be able to withstand the ‘discussions’. LOL!! At this stage of life, arguments are more humor than hurt feelings, at least that is how it is in my house. LOL!!!! Sunny Side Right? You are blessed JaFree. ENJOY!! and consider alternatives with external events. only small gains but pays a few bills. to apply more balanced thinking. Phil, that last sentence is a ‘hard one to make at anytime’. Your doing it here is humbling to me. Thanks very much for sharing that. We all have to walk our own paths but my experience tells me that our lives are also governed by waves. So nothing happens in a straight line. no need to be humbled what so ever!, appreciated and thank you. HURRRUMPH!! This market clearly didn’t get my ‘road map’ memo about where it needs to be to start a ‘santa rally’. IF it tries to start the ‘santa rally’ from these ‘lofty heights’ then poor santa’s in for asphyxiation due to the heights that him and his deers are going to have to climb. Rudolph ain’t going to have a ‘RED nose’ at these heights and …. ‘Rudolph the Blue Nosed reindeer’ doesn’t have the same ring to it. Now who was in charge of getting the message across again? Mmmm seeing Sept H&S fail now Nov IHS testing. This must go complex to make thee move from Aug low appear impulsive. The great decider is here and now with seasonal behaviour pulsing through its internal organisms. But my negative take remains the same until this creature behaves otherwise abnormally in an irrefutable manner. It has a weak immune system, it suffers from AIDs. Peter_ you are almost making me feel ‘sorry’ for the market here. However I’d rather the market caught AIDS than any individual so there is some redemption in there. I’m happy to stand corrected here, but for an IHS to occur it has to start higher before the left shoulder forms…which is not what is happening here. I do however agree that this thing appears to have run out of steam…. (I hope). American winter demand for NG is greater than wellhead production which is why there is underground storage of NG to make up for the lack of winter time wellhead production. Most American underground NG storage comes from the conversion of older industries such as underground mines to more modern NG storage. Problem is that underground mining ended decades ago due to laws, safety, and environmental regulations. Most new mines in America for the past several decades have been open pit mines. This has limited the ability of new underground storage to keep up with winter time demand. This means the potential for an imbalance of winter time demand to winter time supple. Winter time supply is both wellhead production and drawdowns from underground storage. Should winter time demand deplete underground storage then there will only be static to falling wellhead production that will be rationed by either market forces (prices) or government degree. An extremely cold winter can bring on ultra high demand and not just because of all the coal fired plants that have been converted to NG but because of all the Peaking Plants that have been built which are all NG fired. There has been no comparable increase in underground storage to meet such an unusual high demand; thus, the potential for an NG market imbalance triggered by a very cold winter. In the American NG market I believe that there is a “structural imbalance” that will show itself with an unusually cold winter wherein the Commercials will “capitulate” to the Large Specs who will have “cornered” the NG market. I believe this will be a “once-in-a-lifetime” event to make a fortune in a six month time period meaning for some to go from “middle class” to “lower rich” in as little as half a year. Please give us an ENTRY price……. and a STOP. Alternatively give us a Support and Resistance level. How big a shortfall do you foresee? 20%? 50%? Do you have any sciemtific stats to support your call ? What happens if its a mild winter? Richard, I appreciate your contrarian thoughts. Without saying too much, I’m in the energy business and there is widespread consternation about depressed NG prices. A pick up in volatility would be a very welcomed development indeed. Best of luck to you, John, and all contributors here. FWIW, I’m out of sugar as of this week and moved into the roach motel that is gold miners. I just can’t help myself as the value is too compelling. Strong hands unite. Other positions that interest me are MBT and Brazilian banks. Happy Thanksgiving to US centric folks. What do you think will move the Gold Miners UP? Or just old fachioned DEMAND? This is where we diverge. in the 2013-14 Winter, we were at average storage and we had the NG spike like the one we are hoping for this time. However, there are differences this winter. How does this all balance out NOW is the question. It is important to understand these differences. Oil is truly important in 2013-14, NG became more expensive to run peakers, so the choice was to run oil instead. That will cap the height of the NG spike most likely. However, new pipelines and turbines brought online coupled with cheap NG will spike demand if we get the expected cold. realm of possibility, but not easy to get there. I absolutely hope you are right though. Specifically addressing this item. Wells get shutdown in the winter depending on how bad the weather is and if that weather is where the wells are. It is always a question to how much production will get shutdown and when will it get shut down. So this is always a factor. If in fact it does get shutdown early, your scenario is more plausible. It will be harder to catch up on production going forward as the wells reduce output. The next year or so should be very interesting to see how this plays out. The Electric Grid Industry continues to march forward on demand, so interesting times for NG. Let’s go read that report now. WOW! Net increase of 9 in NG storage. That blew away many of the forecasters I watch. As a matter of fact the most accurate one I like predicted a rise and everyone else had draws. Next week will be the big draw. I have to dissect these numbers to see what is going on. My team monitors quarterly earnings in the US, which have historically been a great forward indicator. Since 1989 US quarterly earnings have fallen on six occasions. The first five of these have seen US equity markets fall from top to bottom -20%, -22%, -51%, -58%, -9%. The sixth and most recent fall in quarterly earnings was last quarter so it will be interesting to see where this leads us. Gary, in the mid 80’s I used to work for an Aussie software company and they had 3 managers sent over. MOST of the time these blokes would be at ‘logger heads’ with each other. They would argue about everything from the colour of the sky on the day to the software methodology to use for a particular problem. However every so often they would ‘suddenly agree’. That’s when us ‘brit employees’ would look at each other and pay attention!! Hope your hedge fund manager represents the latter case. BTW I’ve just looked out of the window and can see a beautiful round FULL moon. So…why is the market not tanking? Is this a ‘stand off’ between Full Moon (down) vs Thanksgiving (up)? I believe SPX high 2134.72 likely the high from which declined abc to 1867.01 Spx from 1867.01 abc to 2116.48. From that point we have bizarre heavily influenced central bank action that reversed the decline from 2019.39 to 2097.06. My bizarre count from 2097.06 decline to 2084.97 labelled 1 rise to 2095.61 ‘a’ decline to 2070.29 an irregular b and am looking for a mini 5wave c to 2095.61 area without going higher than 2097.06 for a ‘c’ completion and wave 2. From there another bear thrust down. Obviously, stop loss orders placed as the SPX must not exceed 2097.06. So maybe your full moon will not disappoint you. Haha!! That is such a nice story….bread man. Enjoy your toast. Edward B, you are a good E Wave counter AND a ‘brave’ one!! I’ve not had anyone call the counts as ‘close’ as you have in a very long time. I tend to do THAT sort of counting on my 5 minute charts!! Hope it works out for the BOTH of us….and all the other bears here. ….but that’s the thing about E Waves. They either behave or they don’t. No ‘maybe yes maybe no’ bits to muddy the waters. I like that because it gives me an ABSOLUTE ‘get out now’ card. Happy Thanksgiving to you too and ALL those willing to take a toast to the occasion!! Nothing like a nice drink to start/send off a celebration. Is there a typical lag from warning to Low point? That’s a really useful and clever question ‘bread man’. (Hovis in UK is a bread manufacturer…just in case you didn’t understand the connection). No insult intended and hope none taken. No none taken – I’m from the UK and like tea and Toast every now and again hence the name as I was eating that particular brand when deciding on a name. HOVIS, the interview was taken prior to the ~12% decline in August so it was well-timed in terms of anticipating a fairly severe correction. (A fall in earnings has been referenced by John many times on this site as a primary cause for a market decline). We’ll just have to wait and see if that ~12% decline constitutes the entirety of the market’s top to bottom mood. Gary, Thanks for the reply – I did have this on my to-do list for 2016 so a bit of research will keep me busy – It’s more than likely going to be in an almanac which I need to get myself a copy of. Hi John – your Bradley turn 11/25 fortifies my bizarre bearish post. Let’s see what happens. Thanks — I missed your “bizarre” post, but I guess it says waterfall here and now? Just do an internet search, you will find it. You asked alot of questions, but I will focus on this one, becasue that is all that is needed. First off, NOAA is a very large organization and I do not want to cast all of them into the same bucket. There are factions within NOAA that do not agree. They only report heavily what they want you to see. This is not a conspiracy theory either. It is Black and White. NOAA has a raw data set, that used to be considered the temperature record. Now they consider it a data source to be modified. However, they do publish the raw data. They come up with many schemes for why the adjusted temperature record is the one to follow and that is too big of a scope to discuss here. But understand that this is not a hidden activity, rather they justify it as good science. I and many many others STRONGLY disagree. Of course my opinon doesn’t amount to much, but many others in high regard to this science are alarmed at the scale of the adjustments. Here is the reason I cannot agree with the adjustments. The raw data matches the Satellite data in the trends. The modified data does not. As a matter of fact, the NCEP data which is also provided by NOAA also agrees with Satellites. This data set which is NEVER put into the media is a global measurement taken every 6 hours and is used to put into Global Weather Models (Not Cliamte Models). NCEP measurements started sometime in the late 1970’s. These models are basically used to predict our Weather. if you get this data set wrong, you will not have accurate weather predictions. I certinaly hope you decide to investigate, because this is only the tip of the ice berg. You will quickly find out that global temperature is anything but trivial. Here is a great site to get you started. Investigate Judith Curry if you are looking for an insightful real scientific approach to the complex Cliamte Science. As an addendum, keep in mind when the news states that NOAA or NASA has confirmed the hottest year or month ever, they are using this adjusted data. In almost every case the other data sets do not come to that same result of hotest ever. Thanks for suggestions on what to look for. But what I’m asking about specifically is your statement about NOAA modifying the temperature record. As I said earlier, we have temperature records going back at least one hundred years, and for some locations much longer. Are you saying that NOAA is changing that historical record? Satellite data goes back only to the 1970’s. So what about all the temp data before that? And what is the reason they are giving for “adjusting” the satellite data? Do we not have temperature data taken from thermometers that are on the ground? Why not use that data? And use satellite data for those parts of the earth that don’t have on the ground thermometers. Regarding NOAA changing data since the 1970’s, you’re saying they are changing the sat data? Why? Does the sat data agree or diverge from reading taken near the ground? Wouldn’t temps taken at the ground (or a few feet above) be more accurate than sat data? Doesn’t the raw data, that is, the temperature record, from 100 years ago support the notion that the atmosphere and the oceans have warmed up considerably in the last 100 years? It’s a big subject and it’s not my area of expertise, but I don’t yet see any evidence of a big cold sweeping down on us. The evidence seems to suggest the opposite. I know that climate takes a long time to see changes in trends, so we’re not going to get an answer in the next year or two. Probably need at least 2 or 3 decades. But I do seem to remember a “forecast” made 10 years ago so that we’d all be freezing by 2020. At this point, that seems very unlikely. A clarification: You’re saying that NOAA is adjusting the sat temp data taken since 1970, right? But they are not changing or adjusting temperature records prior to that date, right? So your complaint about what they are doing applies only to temp data since 1970, and only to temp data from satellites, right? Has NOAA also “adjusted” temp data from 1970 from thermometers on the ground, or just the sat data? Honestly, we could spend hours on this topic and I do not think this is the forum. The data going back to 1880’s till today in it’s raw form shows very little change what so ever. What it does show is a 30+ year cycle of heating and cooling. Obviously any temps before Sat. era cannot be compared, but data since then can. The data being modified is the land data. So I get it you feel like it has been getting hotter, well depending on your age you could be correct. The Late 1970’s during the Ice Age scare was the bottom of the last 30 yr cycle. Basically since 1998, we have been flat. Sooooo, the big question is. Did we Plateau or Is the cooling cycle in play? All evidence to me shows cooling. Based on PDO and AMO. Sun Spot theory is bringing all the Little Ice Age talk, and I will not discount that possibility. After all, we only see these Sun Spot minimums once every 200 years, so basically near ZERO data on what affect there may be. The reasons for the NOAA justification of modification is for various reason, say altitude adjustments, Station Environmental changes ie Urban Heat adjustments, Time of day adjustments, and many more. One thing they have done which drives anyone based on factual science is they do something called gridding. Where you estimate temps based on a gride of other stations. This sounds great and it is something I do as well on unreliable data stations. However, it has been shown that NOAA has allowed the rural cooler stations to die and the urban stations to estmiate the rural stations. In fact they have been caught estimating stations reporting good values but they still estimates them. I am sure everyone will be shocked that they were estimated high. So the adjustments are very much Black and White, but the data surrounding this entire topic is very much gray. I am more inclined to accept the raw data for historical and Sat. Data for current temps. Specifically for the Global Temp. The NCEP land based record would be my choice for land based temps. I personally think the adjusted data should just be thrown in the garbage. just took a quick look at some of the graphs on woodfortrees site. Every graph I looked at that has a time span or at least several decades shows a rise in temps. Looks to me like the long term trend is up. And as I already mentioned, it will take a decade or two, at least, before we can see evidence of a trend change. A bit like the stock market in that way eh? One year temps are up, next year sideways, next year down, but over several decades, the trend is up. Why are we worried about a rising temperature anyway? Mankind prospers when it is warm, there is plenty (of food mostly). When the mini-ice-age arrives and billions starve, maybe sense will prevail. Or maybe not, as matters are now FUBAR on this blue planet. Just a little fun fact about Global Warming. Svante Arrhenius, basically the father of Global Warming, which incidentally was very much wrong on much of his calculations concerning this topic. But he also agreed that a warming planet was good. I also agree. After all Vikings used to farm Greenland. Graves had trees roots running through the coffins. Alaska recently revealed a Giant forest from a melting glacier. That’s great, I promise you that you have not spent nearly enough time on that site, but I am glad you are interested. Also, that is just a place to start. what an uber bullish thanksgiving week. friday close around 2089. with bradley turn date today, spiral calling for a low around 2047 early next week and potential black swans over the holiday 5 day period. should march to 2134. why not? we charged ahead 5% after France suffered its worst attack since WWII. Scott, with a Bradley turn date today, why would it be the case the market would continue its most recent trend, i.e., upwards? I thought the whole point of the Bradley dates was it signified a change in price direction. Predicting price on this commodity is VERY difficult. Fundamentals say price continues to drop. I think the price drop got ahead of itself and will stabilize around the low $40’s for WTI. Not to say it will not drop some more temporarily. Next 6 months should shake out alot of US Oil businesses. This is a pure speculation call and I do not expect many to predict correctly. Anything can change on a dime. I think most of the correction is done though. In any case, my play on oil was KMI with 8+% Div. I personally would stay away from the commodity. Wow, amazing; what happened today in Natural Gas futures was one for the history books. Today was Last Trading Day for the December, 2015, Natural Gas futures. This is the most important day of futures trading including the several days after Option Expiration Day. Open Interest started as 6090 while Volume was 9482. What the….You got to be kidding me. This week started as a Larry Williams’ daily OPPS trade that became a weekly OPPS trade for the expiring Dec futures. During the week, the Dec only corrected slightly more than the 50% Fibo while the Jan corrected exactly to the 76.4% Fibo. Then, late on the Last Trading Day, the Dec rallied up to a new weekly high. And, it did this with exploding Volume. “No Way” say all those who complain on this Blog about paper trading Gold and Silver. “Yes Way” I say. I interpret this historically unusual trade action of today’s expiring Dec futures as being so deeply oversold that the Commercials stepped in and bought heavily because the headache of taking delivery of the physical from the paper futures was more than worth it at these very low prices. I also interpret this week’s and especially today’s trading action as proof that the Seasonal Low is in. I also suspect that this week’s and today’s most unusual trade action is evidence that there is a “structural imbalance” in supply for this winter’s demand. Both sources of winter time supply could be out of balance. Wellhead production might be slightly out of balance for this winter’s demand in addition to supply from storage being deeply out of balance. Excellent Richard, that is something I would not have noticed. Thanks for the data. I have to admit, I was expecting NG to crash after this report today. I am expecting a big draw in the report next week though. Happy Thanksgiving or Fall Harvest, or just plain weekend everyone. Besides the Commercial “tells” that the Seasonal Low is in there are Large Spec “tells” too. Last week’s NG storage report showed a new all time high in storage. Usually, Large Specs act immediately to a report in order to burn as many Small Specs as possible who are position incorrectly. The Futures markets are a negative sum game after all and who better to provide the commission costs and profits than the Small Specs. But after last week’s report the Large Specs did nothing for an hour. It took them an hour to get up a “head of steam” to resume selling NG futures. Even though the report showed a new ATH in storage the weekly increase was less than expected and less than a third of the prior week in the very week that historically starts the seasonal drawdown. But once they got to selling they keep it going even after a “gap down” opening on Sunday night. “Tuesday turn around” in Chicago comes from the federal government gathering the commitment of traders on the end of trading on Tuesday. Large Specs often don’t want others to know how they are positioned so they often undue their positions on Tuesday before the report data is gathered on the close of trading. However, when they are heavily position and proud of it they will continuing adding to their positions all the way to the end of Tuesday’s trade and beyond. But that didn’t happen this week. No, oh no, the Large Specs got “cold feet” and quit their selling and starting buying back their shorts on Monday instead of Tuesday. What this all means is that the Large Specs were slow to sell NG, after the report showing new ATH storage, and quit the selling earlier then they normally do at extremes. These are powerful “tells”, of theirs, –before– this week’s shortened Last Trading day “tells” of Dec NG futures of the Commercials. In my opinion, the multiple Large Spec’s “tells” followed, latter in the week, by the Commercial’s “tells” raises the odds very high that the Seasonal Low in Natural Gas futures is in and that it is a Seasonal Bull Market from here on. Also to add to seasonality at this time of year, we’re also in a 5th year of the decade – historically these have been up years – from memory I don’t think there’s been a down 5th year for at least a century – I might be wrong though. Statistically the odds are on the up side for the year end – in my opinion – even though generally I’m bearish , that bearishness extends to 2016 where I’m forecasting a Low in Dec 2016. You may find this post a bit dodgy. Since young, I used to draw charts of different phenomena. For example ‘friendship charts’ : my frienship with schoolmates was fluctuating in time, I had no answer as to ‘why’ and ‘how’, I only kept ‘fascinating’ records. The most important chart was my own ‘existential enthusiasm’ chart, I have continued to draw to this day. What is it like? Few year bears, few year bulls. I don’t know what caused them, I find no correlation to the events, money wise, relationship wise. This is why, as a trader, I ignore all data, except the price itself. Because, if my optimism can change in time depending on the processes in my head, how can I control what is happening in the heads of other market participants? But here is what I find interesting. I have analyzed recently the dates of the proxigee Moons and most of them were highly correlated to the events in my life. Out of 4 jobs I had, I gave notice twice within one month before the proxigee. My last employment – I was dismissed as I refused to perform duties…one month before the proxigee. My most successful trading strategies were conceived…within one month before the proxigee. The system I started using in 2014, called “Limited Imbalance”, was born on the 1st of August 2014. It was succesful for almost a year and stopped by the broker refusing to accept my trades. I found a new broker, and also was looking for a new strategy, so that it wouldn’t be derailed by brokers’ requotes. The system I use today, called “Rubber Turkey” was born on September 10, 2015. For some extraterrestrial reason, I am breaking the old chains into the closest perigee. I am by no means crazy about the Moon, have just looked at the dates. What does it all mean? 1. Happiness lies within ourselves 2. What lies within ourselves can be affected by the sky 3. We can look at ourselves and keep fascinating records. despe, that is fascinating stuff and highly intriguing to me. I would be very interested to know whether your ‘bull/bear’ years ran in alternating 14/22 year periods, if you care to divulge that. Thx in advance. If you are interested then please drop me a line as I’d like to discuss what you’ve written in more detail. Thx. rally up to December options expiry and then Santa rally. I think dax at 12k and Dow at 19k by First week of January. i reads John’s posts and they show great evidence the market should drop but im staying long and strong. Current have the largest long positions I’ve ever had with stops at break even for 75% of the positions. Will be taking a break over the next month and I see John is too. Hope everyone has a great festive period and I’ll join you going short new year. well good luck, hopefully you won’t need those stops. Wedges wedges everywhere. Not least of which the DAX which is in the process of filling the upside gap as well..